HJr./Sr.H Goes From Good To Great! 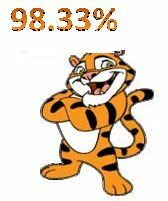 We send a tip of the Tiger’s tail to everyone involved in making our students a success! The IDOE recently released high school graduation rates for 2017-2018, and Hagerstown broke the record it set last year. In May, 98.33% of the Class of 2018 left NCSC with a high school diploma. Acquiring a high school diploma has shown to be a powerful indicator of future success in life regardless of whether the graduate is headed to college, a career or the military. Ms. Oliger, our high school guidance counselor, is quick to point toward fellow staff members, community volunteers who work with students and the students themselves who have done the heavy lifting in order to graduate on time; but it is she who tracks each student’s progress for four years to assure that they each reach the goal. Thank you, Ms. Oliger! In terms of graduation rate, Hagerstown High School is ranked in the TOP 10% of all high schools across the State. Congratulations! We are very proud of these students and this accomplishment. Previous: This Doesn’t Happen Very Often! Next: Year Book Photos Help Us Remember!